One of the biggest excuses people make for not getting around to practicing a new language is the perceived lack of time. The thing is that there is actually plenty of time, you just aren’t paying attention. Of all the time you have in your day, your coffee breaks are the most ideal. Obviously, you take these breaks every day. No one said a break had to be about becoming a vegetable. What better way to turn breaks into something productive than to play a language game or review your latest vocabulary? Turning your breaks into practice sessions may seem like a contraction. However, consider how guilty you feel at the end of the day when you weren’t able to spend even five minutes working on the language. By turning your breaks into something productive, you aren’t defeating the purpose of the break. The break is meant to be from what you were doing. Language studying is still a break – it’s just a less wasteful break than staring out the window or scrolling through Facebook. If you do it right, working on the new language isn’t a chore. Since you already make time for breaks, it could be the same thing as making time for your language studies. To keep the break from feeling like work, here are eight suggestions you can do to make your study session fun. There is nothing like playing a game to make something feel like a break. If you are also able to learn and reinforce certain ideas, all the better. There is a wealth of language games available for nearly any type of mobile device; there is bound to be one you will enjoy. Use your coffee break to reach the next level of the game. Not only will you feel good about having worked some practice into your day, you will be energized when heading back to work. Remember though, the game needs to progress your learning. You can’t play something that is easy and expect it to help you. If you want a really unique challenge, change the language settings on one of your current games to the language you want to learn. Since you already know what the game is saying, you will be learning the proper translation for your target language. 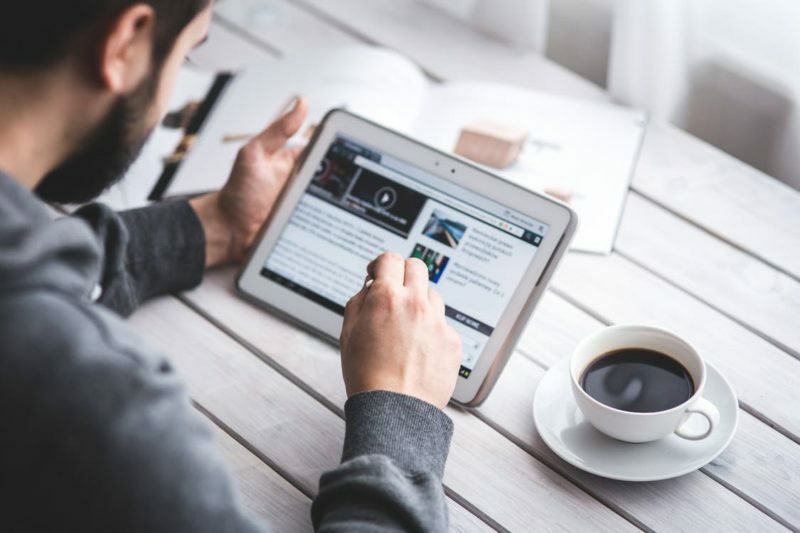 As more newspapers move to being online, you have a fantastic method of learning as much or as little as you want over your coffee break. And you get to keep up with the news – something you probably already do during your break. You can control what you read. Do you want the hard-hitting stuff from the country that speaks the language? Would you prefer something specific to your industry, like tech or business? Or do you want to keep it light by going over entertainment and sports? It’s completely up to you what you read about on your break. Google is probably your fastest resource for getting great newspapers in your language of choice. If you have a current favorite site in English, check to see if it is offered in the language you are learning. If it is, you have a way of comparing each article between the two languages. If you are looking for a break from staring at a screen, there is a wealth of available podcasts. They also use people who speak the language naturally, giving you the perfect opportunity to hear the correct pronunciations. Since they speak at a natural pace, you will become better acclimated to a normal talking speed. You don’t have to restrict podcasts to just coffee breaks either. When you are heading home or out to exercise, you can listen to the podcasts. Break a podcast up into easily digestible chunks over the course of the day. Many podcasts include transcripts. If you didn’t understand what was said or can’t remember something you heard, check the website for the transcript. Describe Your Day in Miniature. Regardless of how you feel about writing, this is a great way to really get a mental workout. You probably already contemplate your day while you take your break, now you can write those thoughts down in the language you are learning. Did something particularly memorable happen? Write a short paragraph about it. Feeling particularly upset about an event? Describe how you feel. You can keep it simple so that you don’t spend the entire time looking words up in a dictionary. It is mostly an exercise in thinking in whole sentences in the language you are learning. This works on two important areas: writing and thinking. By thinking about your day in terms of the other language, you are reinforcing thinking in that language. If you don’t want to write a paragraph, do something as simple as making a list. You can work on the names of foods by writing a grocery list, or activities by writing a to do list. Keep it simple so you can fit it into a break. Easily one of the most portable ways of reinforcing what you have learned, flashcards can be easily used while you are taking a break. If you don’t have flashcards, you can quickly make them while you are sitting around. You don’t need anything permanent, just enough flashcards to go through a couple of times while you rest up. Don’t forget there are plenty of apps that act like flashcards. Know which one you want to use so that you can jump right into your session. The app will group words based on category, so all you have to do is select the one you want. If you don’t feel like doing anything that requires heavy focus, pull out a dictionary. It is chock full of words you don’t know. You should take a focused approach to this by selecting words that make sense for you to know. If you are learning about clothing, choose words that are associated with clothes and shopping (don’t forget the associated verbs either). Pick a few, write them down, and add their definitions. They can be your flashcards for next time. Once you are confident in your knowledge, start using those words in sentences. This suggestion will be tricky if no one else is learning your language (or if there aren’t any native speakers in the office). If you do know of someone who is learning (or knows) the language, strike up a conversation in the language. Don’t worry about how you sound – learners will be happy that they get to practice, native speakers will probably be delighted to get to speak the language. No doubt there are plenty of commercials, clips, and trailers in your target language. Spend the break watching some of them. It isn’t too involved, so stopping will be easy. It builds listening to a native speaker into your day (making it easier for you to understand the language in real time). It also helps you learn more about the culture. None of these ideas take up more than a few minutes, about the average amount of time you take for your coffee break. Working studying into your day could not be easier if you tried.